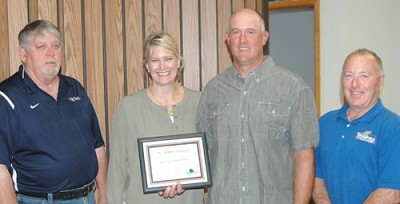 Jeff and Dorie Byrne, center, accepted the Stewartville Economic Development Authority�s monthly Business Appreciation Award at the Stewartville Civic Center last week. Jim Kuisle, EDA president, left, and Mayor Jimmie-John King, a member of the EDA, right, presented the award. Jeff and Dorie Byrne were special guests at the Stewartville Civic Center last week. The Byrnes, owners of Jim Byrne Construction, Inc., accepted the Economic Development Authority's monthly Business Appreciation Award on Tuesday evening, June 19. For more on this story pick up your copy of the June 26 Stewartville STAR.